Does the marketplace need yet another version of Vivaldi’s Four Seasons? 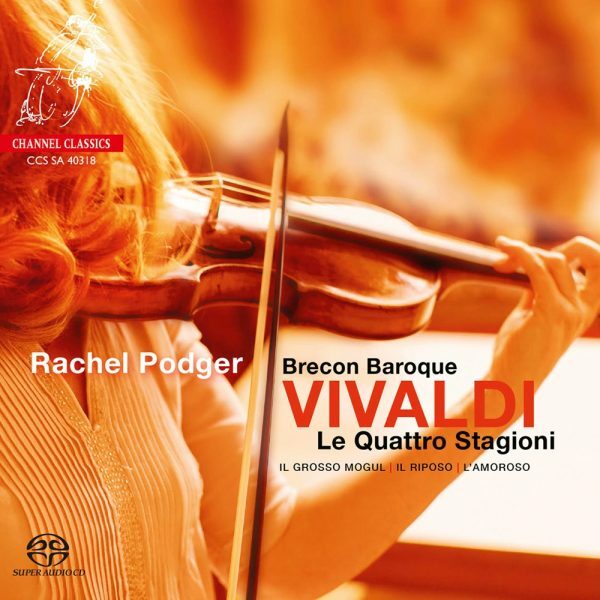 Listen to the short sample from ‘Spring’ on YouTube and you will realise why, having heard Rachel Podger’s latest offering with her Brecon Baroque, the answer is most certainly yes! Podger’s approach to these over-played works is slimmed-down both in terms of phrasing, tempi and articulation and in the number of musicians employed. Spring enters sedately with a feeling gentleness and grace and Podger chooses to emphasise legato. You won’t find the muscular bow-strokes of, for example, Nigel Kennedy in this reading. Podger and her Brecon players see these concertos not as orchestral works but rather as chamber music with a group of eight musicians, one to each part. That said there is no lack of power in the big tuttis thanks to the strength of playing and the exemplary Channel Classics recording. Besides The Four Seasons, we are treated to three more concerti by Vivaldi on this disc. The three additional works are the Concerto for strings ‘Il riposo – per il Santissimo Natale’, RV 270, the Violin Concerto in E major, RV271 ‘L’Amoroso’ and the Concerto for Violin “Il Grosso Mogul” in D major RV 208. This generously filled CD contains imaginatively interpreted, superbly performed Baroque concerti of the high standard we have to come to expect from these exceptional musicians during the year in which Rachel Podger will celebrate her 50th birthday. I have no hesitation in making this disc our CD of the Month and, even if you already own one or more versions of The Four Seasons, I would urge you to go out and buy this refreshing new account. Purchase from Presto Classical or stream on Qobuz.